Shop at popular websites and stores. Fry’s Food Stores: Did you know you can show your support just by shopping at Fry’s? It’s easy when you enroll in Fry’s Community Rewards! To get started, sign up with your V.I.P Card (if you don’t have one, click here), and select Reid Park Zoological Society #91044 to support. Once you’re enrolled, you’ll earn rewards for the Zoo every time you shop and use your V.I.P Card! AmazonSmile: AmazonSmile is a simple and automatic way for you to support your favorite charitable organization every time you shop, at no cost to you. When you shop you’ll find the exact same low prices, vast selection and convenient shopping experience as Amazon.com, with the added bonus that Amazon will donate a portion of the purchase price to your favorite charitable organization. Click here to sign into your Amazon account, select Reid Park Zoological Society as your charity of choice and you will be set to shop and benefit the Zoo. We are always in need of items for our animals and educational programs. 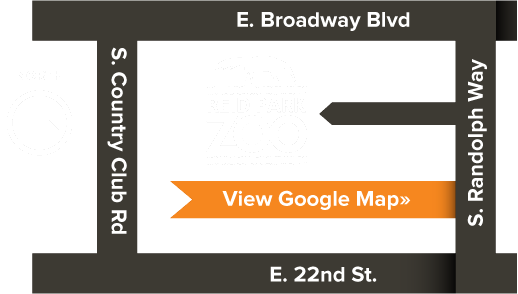 Show your support for Reid Park Zoo by selecting items to purchase from the below lists. Once you’ve made your purchase, drop off your donation at Reid Park Zoological Society offices at 1030 South Randolph Way. Bear foraging ball, saurus egg, weebles, elephant rattle bag, moster ball. Craft Supplies (new): Glue sticks, crayons, washable markers, permanent markers, popsicle sticks, etc. Leatherman-type pocket tools such as this one. If you are an employee of a state, county or city government agency, you can designate the Reid Park Zoological Society as the beneficiary of your workplace giving campaign. Simply enroll in the State SECC, City ECAP, or Pima County ECAP program to make a lasting impact in your community! Build new animal habitats for over 500,000 annual visitors to enjoy year-round. Provide quality care to over 250 Zoo animals. Enhance the Zoo’s educational programs for over 50,000 annual participants. Bring great events to your community year-round. Contribute to the Zoo’s conservation efforts that protect wild animals and wild places. The Reid Park Zoological Society’s city and county number for the employee giving campaign is 1604 and the state number for employee giving is ST1304. In addition to federal, state, county or city government agency giving, employees at area businesses may have giving plans through the United Way. You may also write in “Reid Park Zoological Society” as your agency of choice. Click here to see United Way agencies that manage employee giving plans through businesses and government agencies.